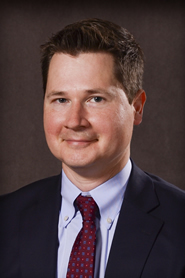 Ed Dawson joined the faculty of Southern Illinois University School of Law in 2014. He teaches constitutional law, criminal procedure, civil rights, legislation and administrative process, and federal courts. His scholarship focuses on civil rights law, in particular the law of 42 U.S.C. § 1983, and constitutional law. Ed is a graduate of the University of Notre Dame and University of Texas School of Law, and former judicial law clerk to the Honorable Ed Carnes (United States Court of Appeals for the Eleventh Circuit) and Honorable Anthony Kennedy (United States Supreme Court). Between his clerkships and academia, Ed practiced appellate law in Austin, Texas, for eight years, most recently as a partner at Yetter Coleman LLP. While in practice, he represented clients in Texas state trial and appellate courts, and federal trial and appellate courts, and the United States Supreme Court, in a wide variety of cases, including public-law cases and commercial disputes. Prior to joining the faculty of SIU, he was a teaching fellow and assistant professor of professional practice at LSU’s Paul M. Hebert School of Law, where he taught legal research and writing, civil rights litigation, and constitutional law.